Will someone pleeeeeeeeeeeeae buy this woman a cheeseburger. This can't be healthy, and I don't recall seeing photos this scrawny before George. I doubt anyone eats at these events. I’m assuming this wasn’t a sit down dinner event? Maybe they ordered burgers and fries from The Carlyle at midnight. At least I would. I’d be starving at that point. Amal looks pretty healthy to me. I’m as slim as Amal is, especially from the waist up and I can assure you I eat my share of pizza, pasta, burgers, salads, wine and Casamigos. Looks can be deceiving she is probably very healthy , she is probably at the lowest weight for her height , she is I believe 5'7. would be dumb enough to get too thin and be unhealthy with all the things she has to do . Nor do I think George would allow her too. My husbands best female friend was always thin as a matter of fact she was called bag of bones, she was indeed quite healthy just very slim. Thanks for the lovely set of pictures. I do like Amal's dress....Very striking and unusual. phone and no guesses at what they're looking at. Joanna wrote: Thanks for the lovely set of pictures. 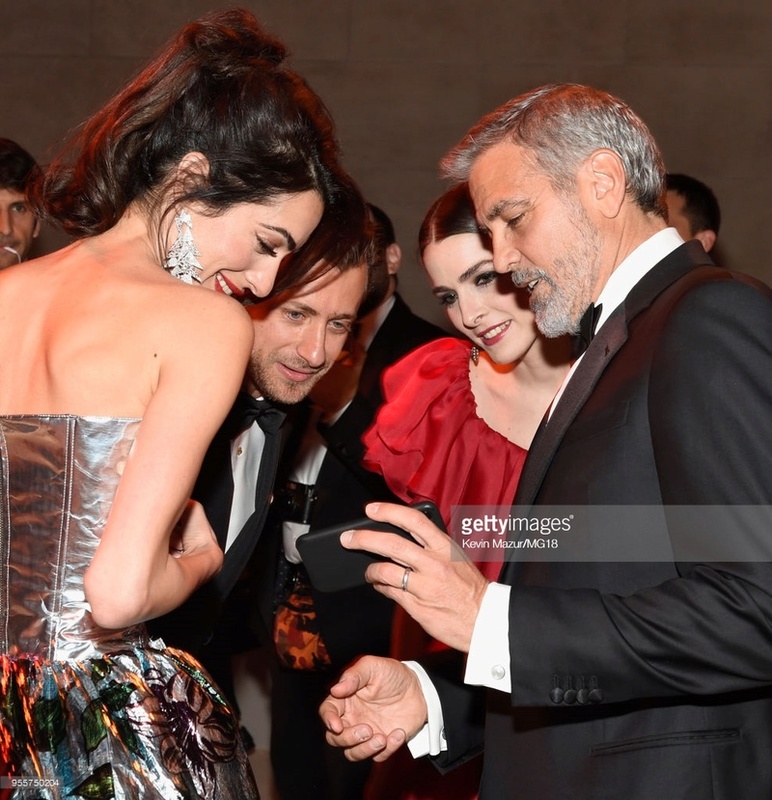 I think they are looking at George and Amal's twins. Even Godparents like myself, like showing pictures of the little ones. Oh dear Benex. It's not happening. Think you might have given her some advice, Donnamarie! I think the whole explanation of how Amal's costume correlates with the theme is pretty silly. Just like you can rationalize just about anything, I also think you could pick any of these dresses worn last night and find something in common with the Catholic Church with its rich history and symbolism. Also, IMO Cindy C. felt probably dragged to this thing because of her friendship with George. There was not a lot of effort put into what she was wearing. Also, she had to make sure she didn't upstage Amal which would be easy to do. party animal - not! wrote: Oh dear Benex. It's not happening. Premiere... I don't think you got the memo. Cindy actually attends this event every couple of years She is friends with Doenatella and Anna. she liked. Not to mention there was no way for her to know what Amal was wearing. That was benex, I just responded. 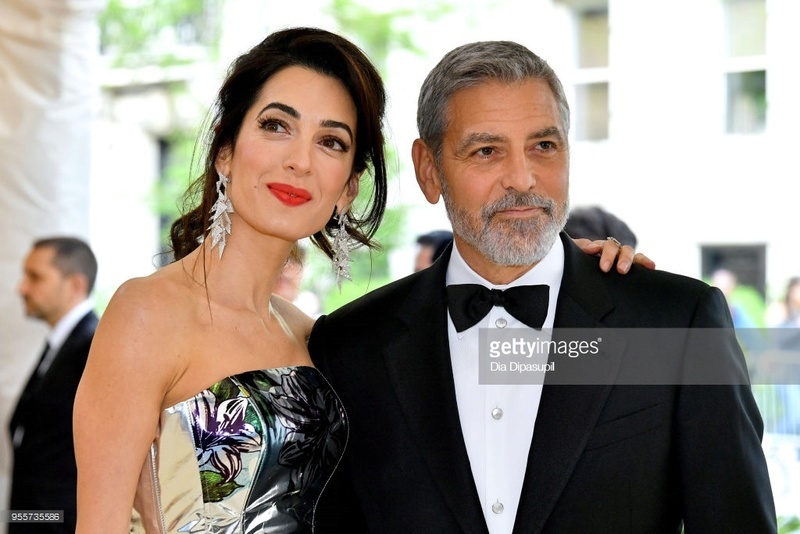 Annemarie -They might have discussed the Gala over dinner Sunday night and Amal might have told her what she was wearing - if she didn't already know. I don't know why she would keep it a secret from her. 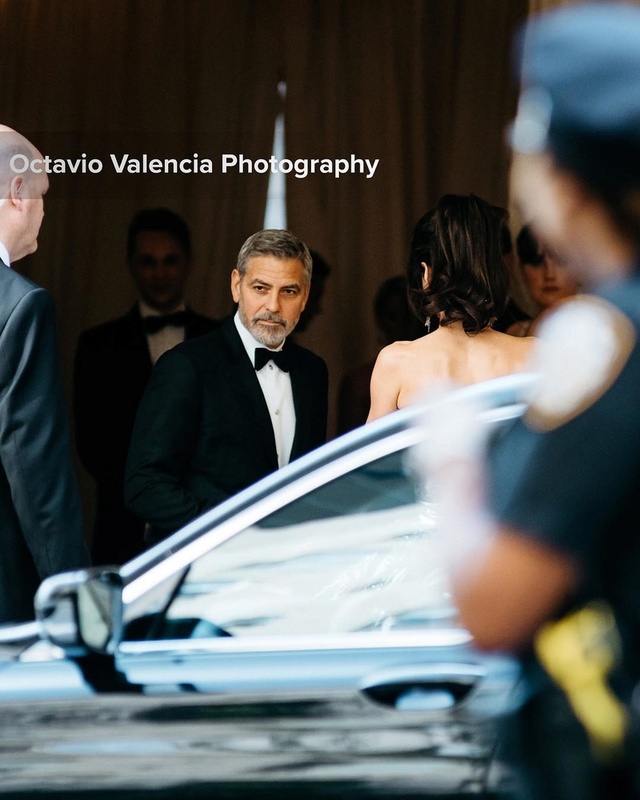 Cindy's been to the gala a few times and might have had some tips for Amal on how to navigate the event comfortably - especially those stairs! I don't know why Cindy chose such a simple gown, but I'm sure it wasn't because she was afraid of showing up Amal. She's a world famous supermodel. She's beautiful no matter what she wears and always gets attention at events like this. True Lizzy girlfriends would talk especially about this kind of event your probably right. Agree annemarie and Lizzy. I think Cindy seems to favor simpler, more classic gowns. I don’t think she is as edgy in her style as Amal is. That’s just my impression ... So even though Cindy’s red gown was pretty straightforward I think that is just her style. There were a number of women wearing beautiful gowns but didn’t seem to be making a big statement as far as the theme of the evening. 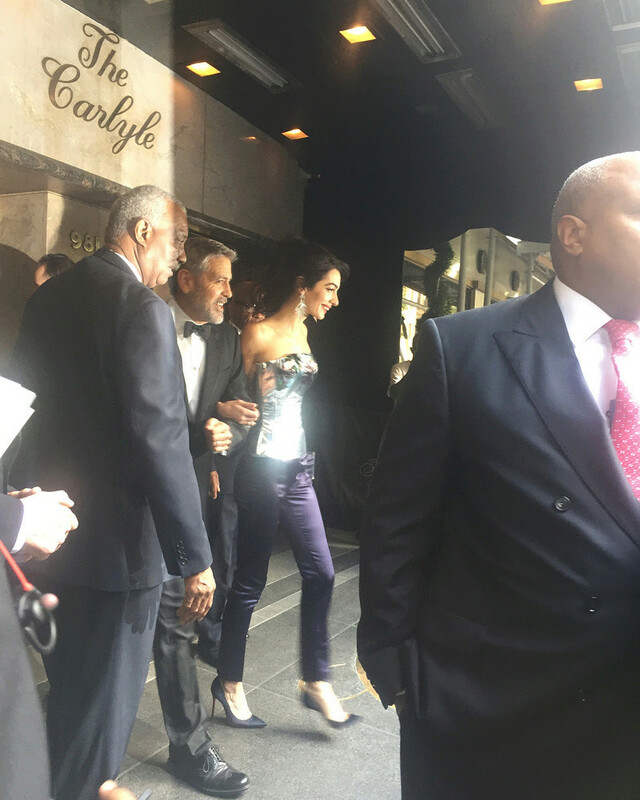 Just noticed in that shot of them leaving the Carlyle Amal's not wearing the skirt to her outfit. Now I'm wondering when that shot was taken. Did she not wear the skirt until they got to the Met? Did she put it on in the car or in the street when they got there? That doesn't seem right. Would she go past photographers without the skirt and then come back out with it on? That doesn't make sense to me either. Then I thought maybe they went back to the hotel to change after the gala, but she was wearing that red dress by then so why would she change back into the first outfit? I'm confused! ladybugcngc wrote: Premiere... I don't think you got the memo. Oh I got the memo. I just chose to ignore it. LizzyNY wrote: Just noticed in that shot of them leaving the Carlyle Amal's not wearing the skirt to her outfit. Now I'm wondering when that shot was taken. Did she not wear the skirt until they got to the Met? Did she put it on in the car or in the street when they got there? That doesn't seem right. Would she go past photographers without the skirt and then come back out with it on? That doesn't make sense to me either. I think she put the skirt on at the Met, before, of course, doing the carpet; they may have arrived a little earlier. It was probably easier this way. Yes, she probably put it on at the Met before they walked the red carpet. Also a few of them changed for the after party , so she took the gown with her. premiere wrote: I think the whole explanation of how Amal's costume correlates with the theme is pretty silly. Just like you can rationalize just about anything, I also think you could pick any of these dresses worn last night and find something in common with the Catholic Church with its rich history and symbolism. Also, IMO Cindy C. felt probably dragged to this thing because of her friendship with George. There was not a lot of effort put into what she was wearing. Also, she had to make sure she didn't upstage Amal which would be easy to do. Yeah, I think that's the same with every year, though. Some people make an effort, others just choose a pretty dress and shoehorn it into the theme. 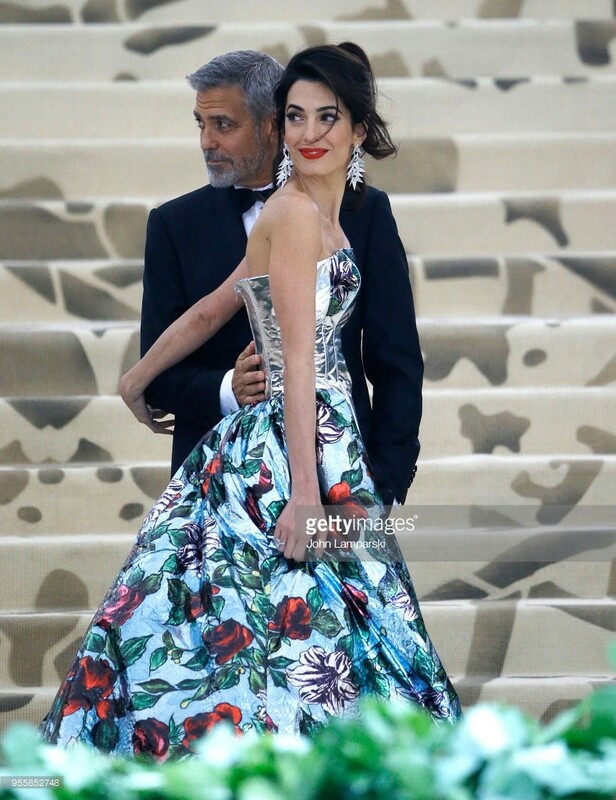 There's no rule about how seriously you have to take the theme, so Amal's dress fits in as well as any others. As for Cindy Crawford, I think she gets invited every year and has done since this started. It's a fashion event above all else and Cindy is a big star in the fashion world. I thought her dress was pretty blah given the event, but perhaps she just wasn't in the mood to play along. I can't imagine she gives a damn about upstaging Amal which is something she could do on any given day and twice on Sunday if you ask me. I can't imagine her wearing it in the car, this simply hadn't worked. Or does anybody think that Kate Perry wore her wings in the car which took her to the Met? Or that Sarah Jessica Parker wore her headpiece in the car? Or Rihanna? Then she would have needed a bus or another very high vehicle. Or remember the yellow robe Rihanna wore years ago (I think it was when Amal first went to the Met gala). No way she could have worn it in a car. So I assume that there's a house / hotel / tent / ... near the Met where they all were able to finish their outfits. I'm still wondering how the skirt bit fastened to the bustier. because there doesn't seem to be anything for it to attach to. Velcro? Staples? Spit and willpower? Did George have to sew it on in the car a la Elisabetta Canalis that one time? @Katie looks like they worked a strong holding magnetic band into the bustier and the skirt! You can just remove it by pulling it of sidewards, so theres no problem in case someone steps on the skirt and its easy to attache and detach it! (1) There is a pre-carpet staging area for the Gala for those who need to use it. As I understand it, most of the participants send their staff ahead with whatever thingamabob that needs attaching/placement/welding. It's off-limits to everybody, probably one of the most secured areas at the event. (2) I am Catholic, and I'm not the least bit offended. Faith and spirituality are wholly internal operations of the soul and heart. Religion a human-created institution and is a choice. The former is not subject to cultural appropriation. The latter is as open to critique, ridicule, satire, and exaltation as anything else. (3) I'm going to go out on a limb and say, despite the resemblance to stained glass, Amal's second dress summons the image (maybe only to me) of the blood of Christ - and all that that concept brings with it. I'm wondering whether the second dress (which for me was the better of the two, but JMO) would have been considered too similar to the red one she wore a couple of years ago to the same event, and that's why she went with the bacofoil/cape/trousers combo? Nah, Katie, I think the wine-colored form-fitting thing, though exquisitely crafted, just wasn't dramatic enough. Amal was an honorary host. Co-hosting with none other than the reigning queen of Met Gala fashion dramatics, Rihanna, and fashion icon Donnatella Versace. She had to go big. Pants, tinfoil shine, train. Otherwise she's just another skinny famous girl in a custom dress. I don't think the red one was dramatic enough, the first one was. The floral gown was definitely more dramatic and unique. And because the red carpet was the focus of the media Amal got to show off this young and upcoming designer Richard Quinn. I think the floral brought a hint of controversy because of the pants (trousers for you Brits) that made it seem a little more edgy and guaranteed it would get attention. I also think the silhouette of the red gown was too small for the Met's grande staircase. For that you need something big and flowing. Maybe that's why Cindy's gown (and others like it) seemed so underwhelming. The thing with Cindy is that she's so beautiful with such a perfect body that she could wear a sack of potato and still steal the scene. Speaking of video, did we have this one? I think benex posted the video with George and Amal, but someone couldn't see it. I’ve seen a number of terrific pics of them both at this event but the first one PAN is a standout. Oops. I was mistaken when I thought PAN posted both Instagram pics. Sorry Carol for not giving you credit. I think both are beautiful. The second one taken on the staircase has an endearing quality to it. Lovely. There are several really beautiful pics of them, and I do agree with you, Donna, that on the staircase they both look endearing at each other. The picture with the three beautiful light beam reminds me of Cinderella arriving to Ball. In the other picture George Clooney looks like: is it midnight yet? 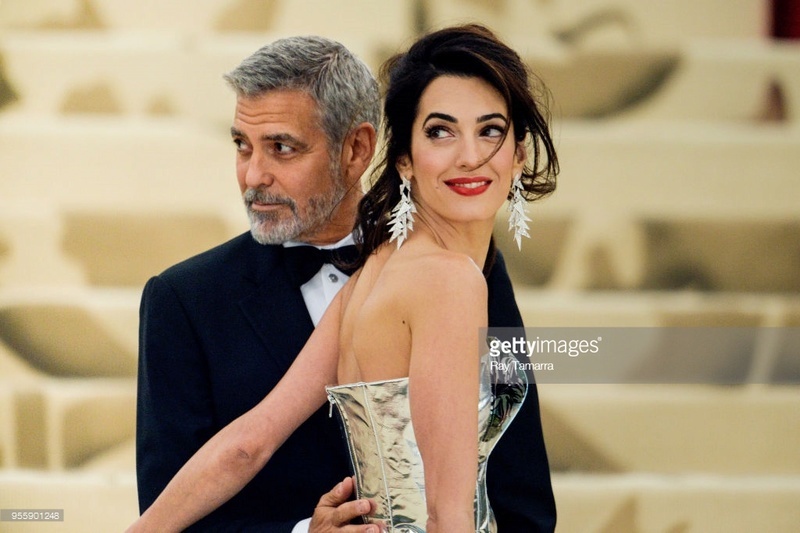 I think this picture is a great combination of Amal having the time of life and George the perfect date. Yes, they do look lovingly at each other , I also like how they reached out for each other when Amal had taken pictures alone. I agree Annemarie, they look like two people in love. George beware one fine day a woman will approach you and say “Taa Daa it’s George Clooney” ... with hands wide open.... Taa Daaa!